Designed to cater to the needs of DSLR audio for video recording, the DR-60DmkII 4-Channel Portable Recorder for DSLR from Tascam is the latest generation of their popular audio recording device. Capable of recording 4 channels of audio simultaneously in up to 24-bit/96 kHz WAV/BWF files, the DR-60DmkII boasts Tascam's High Definition Discrete Architecture (HDDA) preamps and a Cirrus Logic analog-to-digital converter chip for accurate and pristine audio capture. It features 2 combination XLR/TRS microphone/line-level inputs with selectable phantom power, and a stereo 1/8" microphone input, capable of handling high-output microphones and supplying plug-in power. A built-in digital mixer gives you control over panning and level for each track, and allows you to insert a limiter or high-pass filter in addition to setting individual channel delay for distance adjustment. The DR-60DmkII gives you multiple output options as well. The dedicated camera out features adjustable level control to cater to DSLRs that lack input level control. The 1/8" line output can be used to feed a mixer or secondary recorder, while your monitoring is handled by a dedicated 1/8" headphone jack. The device records to SD and SDHC cards and is powered by 4 AA batteries, or an optional battery pack or AC adapter. A 2.5mm remote control input allows you to integrate an optional remote or footswitch control. Quality mic preamps are a necessity for quality sound. The DR-60DmkII's HDDA mic preamplifiers (High Definition Discrete Architecture) employ discrete circuitry and parts, approved after months of evaluation testing by Tascam. The HDDA's circuit achieves a high equivalent-input noise (EIN) of -120 dBu for low input noise. The DR-60DmkII mic preamps have been upgraded from their predecessor for up to 64 dB of gain with XLR input jacks for greater cable compatibility. The DR-60DmkII can record up to 4-tracks simultaneously, allowing multiple microphones to be used while filming. Inputs 1/L and 2/R can be selected for mono or stereo link operation. Box Dimensions (LxWxH) 7.874 x 6.929 x 5.748"
DR-60DmkII 4-Channel Portable Recorder for DSLR is rated 4.5 out of 5 by 143. Rated 5 out of 5 by Joshua G. from A solid recorder the DR-60D is an excellent recorder for the money. A number of other reviews commented on how large it was so I was quite concerned it would end up being this huge bulky recorder. This is very much not the case, While it is quite tall compared to the 70D it doesn't feel inconvenient. Navigation is super easy and the ability to monitor individual channels made it far superior to the 70D in my opinion. Also running dual mono is a no brainer to keep audio from peaking. Also I highly recommend getting the AC adapter to run the unit all day long. Reviews constantly mention the short battery life of the unit which was easily avoided by running it plugged in. Rated 5 out of 5 by Video Putz from Gets the job done, improved my audio Use it on audio for video. Pre-amps are superior to Behringer Xenyx board I was using. Like the built in limiter and duplication feature. Feeds cleaner audio to my camera and gives me even cleaner back-up files to use if needed. The slating feature makes synching up audio files easy. Only used it for one, 10 minute video so far but if it holds up will be well worth the money. Haven't found anything I don't like about it except the documentation is amazingly poor for Tascam products. How can they create such a poor manual but go out of their way to translate it into numerious languages? Hey, Tascam, is it too much to ask that you create an accurate, comprehensive manual? Rated 5 out of 5 by Joey Stickfigure from FULL VS QUICK FORMATTING. FULL FORMAT took about 15mins on a 8 Gig card. Tech at Tascam said it could take hours depending on card size. Be aware, QUICK format it if on set. If you FULL format it it will lock up recorder till its done. If you stop it in middle of format like I did (pulling out a battery) because it would not turn off. The card was then not recognized. I had to format it (Quick) in my PC, then it was recognized. Hope this useful to a new user of one of these, who like me like to push and test every function, button and knob, and sometimes lands me in trouble like this. Great recorder, very quiet, very intuitive operation, compact, solid, well made. I guess Full Formatting just takes time? Never used that mode before. Rated 4 out of 5 by PastorJohn from Essential for beginner video production Would have given it 5 stars...but, 1. I've only owned it a week...the jury is still out 2. It did not play well with my goto tripod because the threaded receiver is recessed too deep. Found an older tripod that it works ok with. 3. Battery life...why bother (other than portability...you'll spend a fortune trying to keep batteries in this). Buy the power supply. It's only about $20 extra My audio for video...not even comparable to the past. No noise at all...it's all gone, just good audio. I went from quite a bit of audio post production to virtually none...other than syncing. I am using an old AT lapel that's really on borrowed time. Can't wait to use it with an even better mic. Rated 5 out of 5 by Thomas from No brainer for Documentary. I just got back from a 6 day shoot in Nicaragua on a new documentary. I spent a month talking with production sound guys, and doing endless research. Here's the bottom line for me. I can deal with the battery life (it's still 2 hours so it wasn't an issue at all), I need spite channels others don't, the price point is great, the size and build works perfectly. The zoom in a bag is just to hard to work with the dials for me. I would HIGHLY recommend this recorder if your a documentary crew that is looking to have a additional sound option for interviews nat sound or DSLR cameras. The one thing to be aware of is the recording steps it's not smooth, if you are in the middle of recording NAT sound and you lower the volume you will hear the drop. It's a non issue for interviews however if your twerking constantly it may be a bother. For us we set it and let it fly and it worked great. Also the menu structure is EASY unlike some of the other systems. If your not spending the 2K on the Sound Designs this one does the trick. Rated 5 out of 5 by McCarthyPhoto from You can spend more, but why? Cons: plastic construction Pros: Low price High quality discrete audio files Excellent pre-amps for the money Multiple connection options (xld, mini, etc.) Phantom power alkaline or usb powered good form factor. I really like this unit and how it fits between my tripod and my camera when I'm shooting solo. Sure, you could complain that it doesn't have onboard mics, but that's not what it's for. If you need that, get a zoom or other handheld recorder. The plastic body won't take much abuse so you do need to treat it carefully and it's battery hungry on phantom power (no surprise there) but it runs a long time on external USB power and the dual stereo function is worth it's weight in gold, in my humble opinion. What are the speed requirements for SD/SDHC cards when recording all four channels at the highest quality settings? I don't record 4 channels at once so I am not the best source for you. I use cards that are speed 10 for what I do and have not experienced any problems. not an audio engineer but honestly probably the same. The dr100 is supposed to be a higher end recorder. What size of screw mount is on the bottom of this? 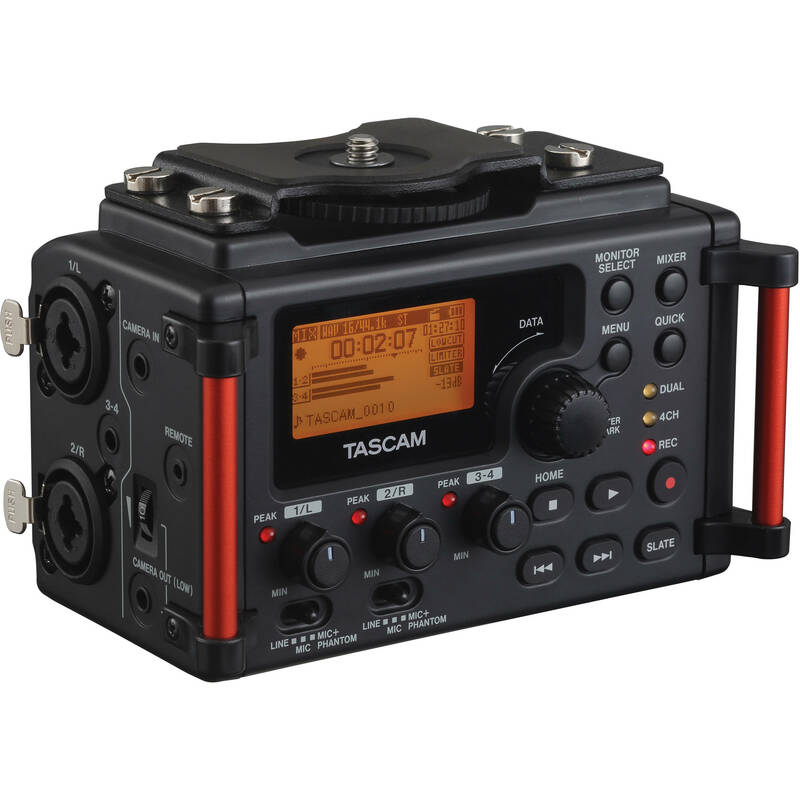 Tim M,1/4 .Full details on the unit's features and functions:&lt;a href= http://www.tascam.com/product/dr-60dmkii/downloads/ target= _blank &gt;http://www.tascam.com/product/dr-60dmkii/downloads/&lt;/a&gt;Thank you for your interest in TASCAM products. Can this be used with the Nikon D7000 or D3s when a Rode video micro is mounted? These older cameras do not have sound meters, only three settings, so can the audio be synced and controlled by the device? I think they're two separate issues. This unit mounts to the bottom of your camera, and any audio recorded would be synced in post anyhow. The Rode micro is connected directly to your camera, no issues there, but you could also connect it here. I use a Ride micro direct to camera as a back up, and use the Tascam for boom, wireless, or other microphones.I don't think there's really an issue with regards to any camera you choose to use with this. Can this device be used as a USB interface with a computer via the USB port? Can it record with Dynamic Microphones? Roger C,As others have indicated, the answer would be yes.Thank you for your interest in TASCAM products. Sorry, you can't record two mono files from the XLR inputs on that model. We have a free download on our website that will split these files into two mono files, called Poly Mono Converter. Go to the downloads section for the DR-60DmkII to download that. Can I plug in two wired lavs and have them both be stereo? Why would you do that? Lavs are monaural source capture devices. Any lavs that are stereo are selling you function with no usable application. Human voice comes from one point source, not a stereo source. (For capturing sound reverb of a given setting, stereo for one vocalist makes sense, but for interviews it does not.) Consider: most vocals in video are mixed down to center channel (such as in 5.1), .... or contribute from a mono track when mixed into an overall stereo mix down.